PROVIDENCE, R.I. — Dozens of teachers hovered around a group of students gathered in the center of a beige conference room on a Saturday morning in April. Other teachers sat in rows of chairs, craning their necks to see the action. The students paid no mind. They tapped on computer keyboards. They wrote math problems with magic markers. They plopped on the floor to work on a group project. 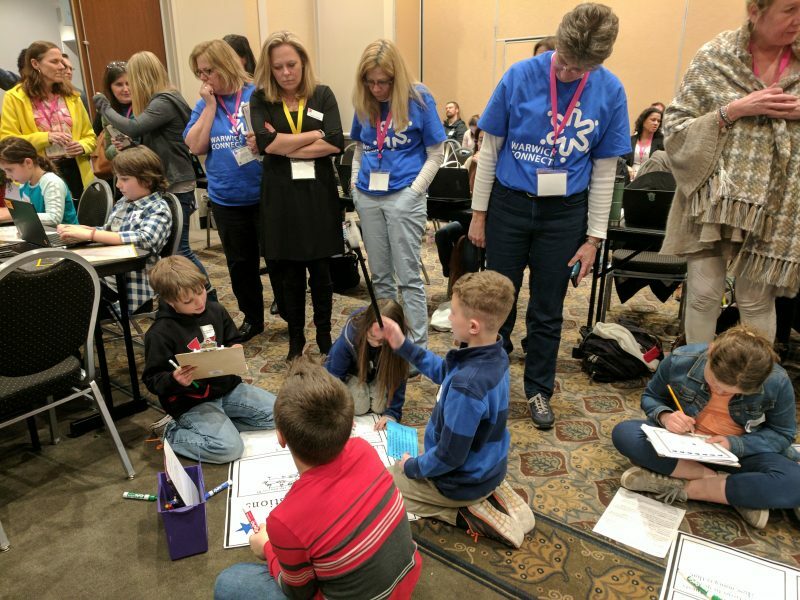 The teacher-spectators were looking under the hood of a new classroom model at Rhode Island’s blended and personalized learning conference. “We want to see how it works, how it’s set up,” said Kim Wilson, a second-grade teacher at North Kingstown Schools. All across Rhode Island, schools are experimenting with the ways technology can help teachers tailor-fit lessons to the unique needs of each student. It’s called personalized learning, and trying to understand how it unfolds in a classroom is not easy. It’s best understood by seeing it in person, and this model classroom provided that view. The technology was there, but students weren’t lined up in a row in front of computers. In fact, the computers almost seemed beside the point — as important and yet as invisible as pencil and paper. And none of the students were looking to a teacher for direction on what to do next. To create excitement, rather than a sense of dread, about new methods of teaching and learning, Rhode Island has partnered with the local nonprofit Highlander Institute to develop a “teachers-teach-teachers” program. Called Fuse RI, it is meant to nurture good ideas by having educators mentor teachers outside their own school districts and serve in leadership roles on administrative teams to help principals and superintendents plan how to use these new models of teaching and learning. Tiny Rhode Island wants to serve as an incubator for the way schools can change when teachers are leaders; indeed, the state launched a program last year called SyraFuse, through which it is sharing what it has learned about personalized learning with the Syracuse, New York, school district. The effort comes at a time when there’s little clarity from the U.S. Department of Education on what support (if any) there will be for classroom technology — including research and funding — from the federal government during the Trump administration. With that lack of leadership, some education reformers say that states need to lead the way in spreading good ideas. States like Rhode Island are “a coalition of the willing and a coalition of the courageous,” Duncan added. And their work starts in the classroom. The select Fuse RI teaching fellows are assigned by the Highlander Institute to school districts to give boots-on-the-ground support. The program, started in 2014, has been viewed by its advocates as so effective that the foundation-funded institute is developing similar programs for yet-to-be-announced cities and states. The Fuse RI fellows offer help that’s something like what you might expect at the Genius Bar at an Apple store. But they aren’t there just to troubleshoot technology problems. The fellows also help solve the human problems of teaching, and work with administrators, who may not have taught for years, to help them understand the realities of working in a modern classroom. So far, Fuse RI has trained nearly 60 fellows (mostly classroom teachers). They serve, essentially, as free consultants to districts and charter schools that are trying innovative teaching models, as many schools in the state experiment with personalized learning. The program, which advertises itself to teachers with a cartoon of a teacher in a ninja suit, requires the fellows to spend about 100 hours per year outside their own school, traveling to and working in whatever school they are advising. It’s also a leadership path for the teachers involved — a way for them to help others, said Maeve Murray, a project manager at the Highlander Institute. After completing their training, the teaching fellows get access to all the school districts’ Fuse RI applications, which describe in detail the districts’ goals. The teachers then choose three districts that suit their interests and location preferences and Highlander determines their placement. The projects the fellows work on can vary widely, but there is one constant: Fellows do their Fuse RI work away from their own schools, allowing them to stand above the fray of local battles and politics. Sprinkled around the state, this teacher-led “dream team” can provide a level of inspiration and technical support that the small nonprofit’s staff could never do alone. “There’s no way we can be all these places,” Rubin said. Iacona, a high school reading specialist in the North Providence Public Schools, has been assigned to work with the Woonsocket School District in northern Rhode Island. The district, which has struggled with its finances, is just starting to rethink how it can collect and analyze student data to improve teaching and learning. Her job is to serve as a teacher voice on the administration’s team as they roll out the new technology. She also spends time helping the teachers. For example, some technology can help create custom-fit lessons that allow students to move through courses at their own pace and study what sparks their interest. This high level of attention to students’ needs and desires has emerged as an ideal in education, going back as far as John Dewey’s 1916 publication of “Democracy in Education,” but it’s extremely difficult — if not impossible — for a teacher to deliver such one-on-one help to every student each and every day in a classroom of more than two dozen students. Advocates of education technology say that the rapid advance in computing now provides the missing ingredient. But forcing teachers to use technology in the classroom has been tried, repeatedly, and usually with disastrous results. Teachers don’t have time to figure the tools out from scratch, and digital devices that are neither wanted nor needed are wasted. Another issue: Students know all too well how to use computers, and without guidance they do what comes naturally — using them as entertainment devices. Related: Will blended learning survive Deborah Gist’s departure as Rhode Island education chief? That’s why the Fuse RI fellows program and other efforts that give educators the opportunity to see and understand technology before they are asked to use it are integral to the Rhode Island plan. The goal is to create a coalition of the willing; teachers wanting to try something new. The changes can then be associated with excitement, not fear. A group of teachers from Woonsocket was at the April conference in Providence. They were giddy about the prospect of having more than one or two devices in their classrooms, but they were also nervous about how they would use the new tools. Their biggest challenge, all the teachers agreed, is time. One of them, Donna Bromage, a kindergarten teacher at Pothier Elementary School, is getting seven new Chromebooks this year. She’s got 25 years of teaching experience, but said she’s grateful for Iacona’s support. Like many kindergarten teachers, her classroom has various learning centers around the room. She used to allow students to pick the centers and groups they wanted to work in. Now, following Iacona’s advice, she is using student data to help create groups and assign stations based on what each student needs. The groupings are more purposeful. “It will give the children the opportunity to learn in a different way,” Bromage said. 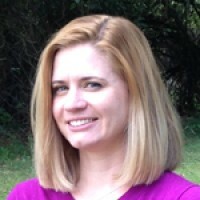 She’s attended other conferences and seen how other teachers enhance and personalize their lessons with materials and programs available online. But when the excitement of those conferences ended, she found that she lacked the tools to try things herself. She’s excited to finally have the equipment to try something new. Like their students, Rhode Island’s schools are at different levels of learning and expertise when it comes to technology. The move to use more technology and to personalize learning is supported by state leaders, but it’s also voluntary. As a result, there are pockets of innovation, rather than one, uniform approach. Now advocates for new methods of teaching and learning hope that educators in Rhode Island can transfer their enthusiasm and expertise to other states, as well. But first, they say, those states must be willing to change their schools not through mandates from above but through teachers who are willing and active participants. John Dewey would roll over in his grave if he knew how his name has been misused to promote the expansion of ed tech & depersonalized learning.